Here are some snazzy birthday facts about 5th of July 1969 that no one tells you about. Don’t wait a minute longer and jump in using the content links below. Average read time of 10 minutes. Enjoy! What day was my birthday Jul 5, 1969? July 5, 1969 was a Saturday and it was the 186th day of the year 1969. It was the 27th Saturday of that year. The next time you can reuse your old 1969 calendar will be in 2025. Both calendars will be exactly the same! This is assuming you are not interested in the dates for Easter and other irregular holidays that are based on a lunisolar calendar. There are 77 days left before your next birthday. You will be 50 years old when that day comes. There have been 18,185 days from the day you were born up to today. If you’ve been sleeping 8 hours daily since birth, then you have slept a total of 6,062 days or 16.60 years. You spent 33% of your life sleeping. Since night and day always follow each other, there were precisely 615 full moons after you were born up to this day. How many of them did you see? The next full moon that you can see will be on April 19 at 11:14:00 GMT – Friday. Fun stat: Your first one billion seconds (1,000,000,000) happened sometime on March 13, 2001. If a dog named Boone - a Welsh Terrier breed, was born on the same date as you then it will be 216 dog years old today. A dog’s first human year is equal to 15 dog years. Dogs age differently depending on breed and size. When you reach the age of 6 Boone will be 40 dog years old. From that point forward a small-sized dog like Boone will age 4 dog years for every human year. The Second Continental Congress adopts the Olive Branch Petition. World War II: The United Kingdom and the Vichy France government break off diplomatic relations. World War II: Operation Barbarossa: German troops reach the Dnieper river. World War II: An Allied invasion fleet sails for Sicily (Operation Husky, July 10, 1943). Korean War: Task Force Smith: American and North Korean forces first clash, in the Battle of Osan. Right to vote: The Twenty-sixth Amendment to the United States Constitution, lowering the voting age from 21 to 18 years, is formally certified by President Richard Nixon. Military coup in Pakistan: Zulfikar Ali Bhutto, the first elected Prime Minister of Pakistan, is overthrown. The first Indonesian presidential election is held. What does my birthday July 5, 1969 mean? 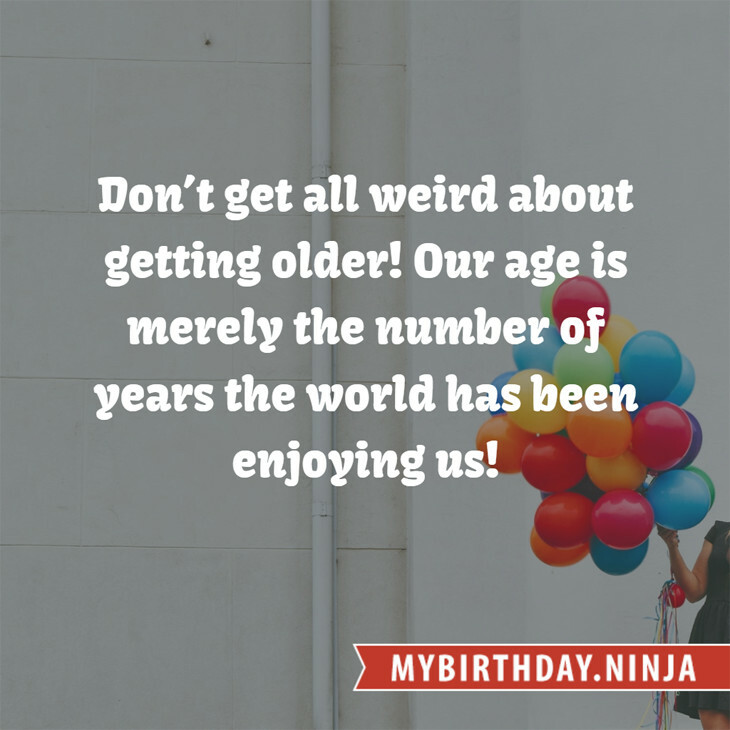 Your birthday numbers 7, 5, and 1969 reveal that your Life Path number is 1. It represents initiative, potential and singularity. You are a born leader. You insist on your right to make up your own mind; you demand freedom of thought and action. The following celebrities also have the same life path number: Barbara Britton, Frank Bonner, Gary Talley, Carl Barât, Nelson Eddy, Cormac Battle, Anna Tomowa-Sintow, Carlene Carter, Luc Bondy, Dany Robin. What is the birthday horoscope for Jul 5, 1969? The Western zodiac or sun sign of a person born on July 5 is Cancer ♋ (The Crab) – a cardinal sign with Water as Western element. The ruling planet is Moon – the celestial body of moods and emotions. According to the ancient art of Chinese astrology (or Eastern zodiac), Rooster is the mythical animal and Earth is the Eastern element of a person born on July 5, 1969. Fun fact: The birth flower for 5th July 1969 is Larkspur for haughtiness. 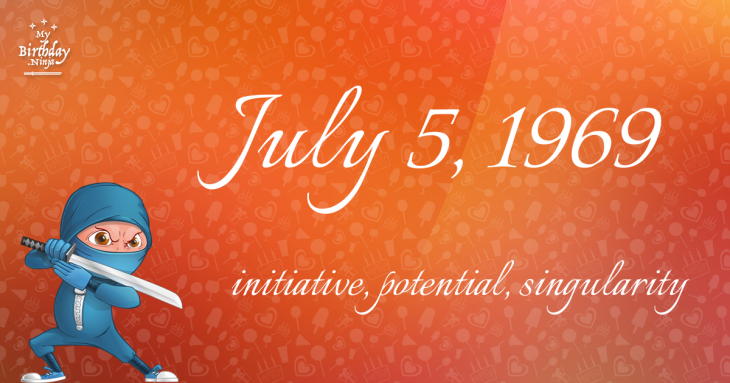 What is the Love Match for Jul 5, 1969? When it comes to love and relationship, you are most compatible with a person born on January 15, 1997. You have a Love Match compatibility score of +198. Imagine being in love with your soul mate. On the negative side, you are most incompatible with a person born on February 1, 1987. Your incompatibility score is -141. You’ll be like a cat and a dog on a love-hate relationship. Arf-arf, I want to bite you. Meow-meow, stay away from me! The number-one hit song in the U.S. at the day of your birth was Love Theme from Romeo and Juliet by Henry Mancini as compiled by Billboard Hot 100 (July 5, 1969). Ask your parents if they know this popular song. I do not know how you feel about this, but you were a male ♂ in your last earthly incarnation. You were born somewhere around the territory of Greece approximately on 1600. Your profession was jeweler, watch-maker. How many babies were born on July 5, 1969? Base on the data published by the United Nations Population Division, an estimated 120,942,839 babies were born throughout the world in the year 1969. The estimated number of babies born on 5th July 1969 is 331,350. That’s equivalent to 230 babies every minute. Try to imagine if all of them are crying at the same time. What is the popular baby name on 5 Jul 1969? Here’s a quick list of all the fun birthday facts about July 5, 1969. Celebrities, famous birthdays, historical events, and past life were excluded. Try another birth date of someone you know or try the birthday of these celebrities: July 17, 1968 – Beth Littleford, American comedian and actress; August 28, 1942 – Sterling Morrison, American singer and guitarist (The Velvet Underground) (d. 1995); August 22, 1978 – Robert Levon Been, American singer and guitarist (Black Rebel Motorcycle Club).